What's the Best Beadwork Stitch to Learn? There is no single best beading stitch for beginners to learn. Everybody is different, and we all have our own different styles of learning. Some people have a hard time learning brick stitch, while others find it to be one of the easiest beadweaving stitches. Many people learn flat even-count peyote stitch as their first beadweaving stitch, and for good reason: it’s a very versatile stitch, meaning that you can use it in many, many different ways. It can be used to make all types of beaded necklaces, beaded bracelets, beaded earrings and beaded rings. It can also be used to make beaded sculptures, and it can be used to cover other objects like rocks and flexible tubing. Some things that may help you determine the best stitch for you to start with are looking at what materials you have to work with. 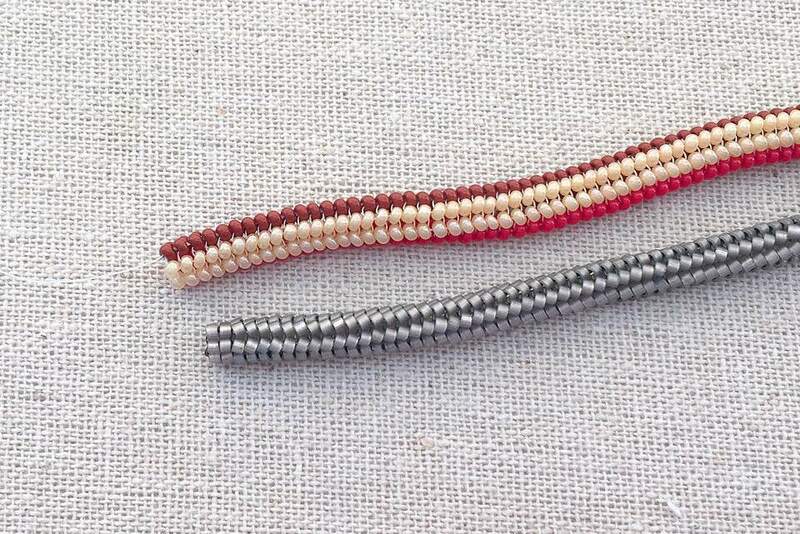 If you have cylinder beads, peyote stitch will be easier and more satisfying than if you have unevenly sized glass seed beads. In addition, you may want to consider what type of project you are interested in making. If you would like to make rope style bracelets or necklaces, spiral rope stitch is perfect for beginners, as is flat spiral stitch. Both of these stitches lend themselves to good results with a variety of types of beads. Most people seem to prefer to learn a stitch while they are making a project, but it can be so much easier to learn a new stitch without the expectation of making a finished project! You'll have more freedom to play with types of beads, and tension and not feel any pressure if you make a mistake. To do this, all you need to do is make a little swatch or sample of the beading stitch you have in mind. You can keep these swatches or samples as a reference for later on if you find a project you want to make and need a reminder of how to work the stitch. Or it can also show you how much you've improved at the stitch and remind you of early errors. For the people that find it easier to learn a stitch as part of a project, just remember that the project may not be perfect and have realistic expectations. To do this, all you need to do is find a project that appeals to you and follow the directions. You might want to have a reference handy on the basics of a particular stitch if you haven’t worked it before. There are lots of free tutorials on the site that cover the basics of most off-loom beadweaving stitches, and you can also find basic instructions in most good beading magazines or books. Starting with a quick project will probably give you the most satisfaction - like making a peyote tube bead or even count peyote ring. If you get frustrated with a stitch, there’s nothing wrong with putting the beadwork down and walking away from it for a little while. Or, you might ask a friend for help. You can also take your work to a local bead shop to see if there is someone there who might be able to offer some advice and guidance. Use large beads for the first few times. This will make it easier to understand the thread path, or where you need to stitch the next bead into place. In some cases, using large beads can make maintaining consistent tension difficult, so if you notice the stitches are loose, try changing to the type of beads recommended in the project instructions. Use two different colored beads to distinguish between rows. This is especially helpful when working in peyote stitch, herringbone stitch, tubular stitches or single needle right angle weave. Use a light colored thread with your beads. Light colored thread is generally easier to see while you are stitching.